Who has the lowest prices on school suppiles? It's now peak back-to-school season. Many stores are advertising low prices. But who really sells the most for the least? We found Nicole Smith and her daughters checking their back-to-school haul from Target. Smith says Target's smartphone app makes it a no brainer for their school supplies. "I use the Cartwheel app," she said. "It takes money off and gives me good deals." But would the Smiths perhaps save more at Walmart or Amazon? Ellie Hoffman, who we found at Target, thinks she might save more elsewhere. She now does a lot of her school shopping online, to avoid crowds, and for free two-day shipping thanks to Amazon Prime. "We have a Prime membership," she said. "So if we find something online with Prime, you get it very quickly." To see who has the best deals in 2017, we checked prices at four big national retailers: Walmart, Target, Staples, and Amazon, with the help of Don't Waste Your Money researcher Carrisa Salyers. Staples was $65, the most expensive. Target was $57, a bit cheaper. Walmart $53, the low-price winner. However, on certain days you will find lower prices at Staples on a few specific items, as they often have dollar sales and even items for just a penny. Check Staples' flier for weekly deals. Of course more and more parents are doing their shopping these days online instead of going to bricks and mortar stores. But will Amazon really save you money when it comes to back to school? We were surprised by what we found. It turned out Amazon had few deep discounts, and was highest priced at $108 for our basket. 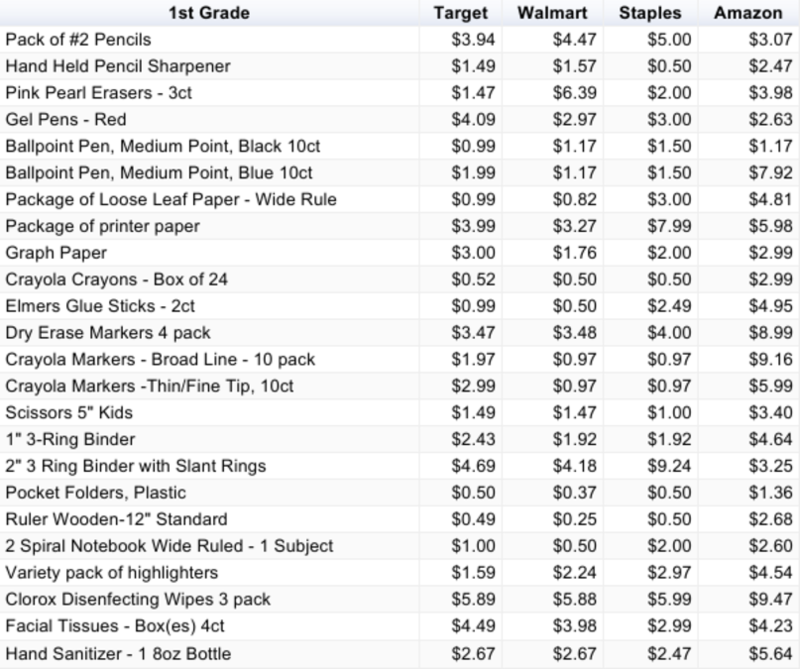 It may not have been a fluke: a survey this summer by price comparison site Wikibuy found the same thing, that Amazon's school supplies were 15 percent higher on average. It says Amazon doesn't offer the penny deals and two-for-one sales that you will find in almost every store right now on various school supplies. Without the big sales, Amazon's price came out highest. Nicole Smith says for now, she's fine with that, because she still likes going to the store. "I have considered shopping online," she said, "But it's easier when I can see the items in my hand." That's especially true with pants, gym shoes and backpacks, where your child can try them on. Meantime, dollar stores may be even cheaper than Walmart on some items, but don't expect a very wide selection.